I’ve been absent the better part of the last fiive months from the Every Woman Blog, not really because I wanted to be absent, but because I have been fighting a pretty bad case of “writer’s block” and struggling with what to say that will matter to people. You see, when I first decided to enter the blog’s contest, I wanted my writings to be beneficial to someone. I wanted to “pay forward” the help that I received in words, thoughts, and prayers from some wonderfully special people who helped me make it when I thought I couldn’t and wouldn’t. As I write this post, I’m sitting in one of my “happy places,” my in-law’s condo on Hilton Head Island. The boys are sleeping soundly and their angelic faces and even breaths make me smile, and I am grateful. I’m grateful for a pretty good night’s sleep and grateful for what looks like will be a beautiful day ahead for my little family. As I do many mornings, I have risen and have been reading the news online. There seems to be tragedy and heartbreak on every site; from WIS to CNN to MSNBC: death and killings and war and bombings and terrible tornadoes. My problems and my ability to cope or not cope seem so small and minor and trivial in comparison. I read an article about a teen in Oklahoma who lost her mother in the recent tornadoes that struck the town of Moore. She laid her mother to rest one day and accepted her high school diploma just one day later. I cannot fathom; to me it is unimaginable. This past Friday night, I attended my high school alma mater’s commencement services, where the commencement speaker was a young man in his early 20’s, a young man who, himself, had graduated from the same school about five years before. 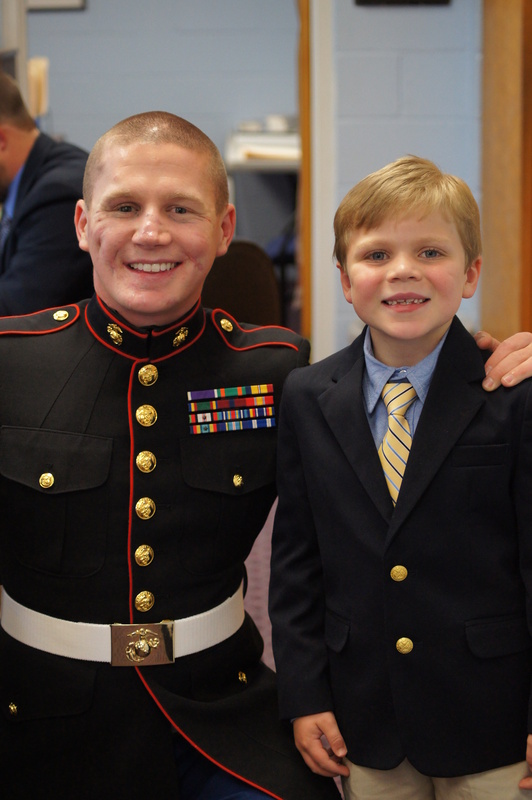 As Pierce and I entered the school, there he sat in the office talking to the school athletic director, sharply dressed in Marine Corps dress blues. 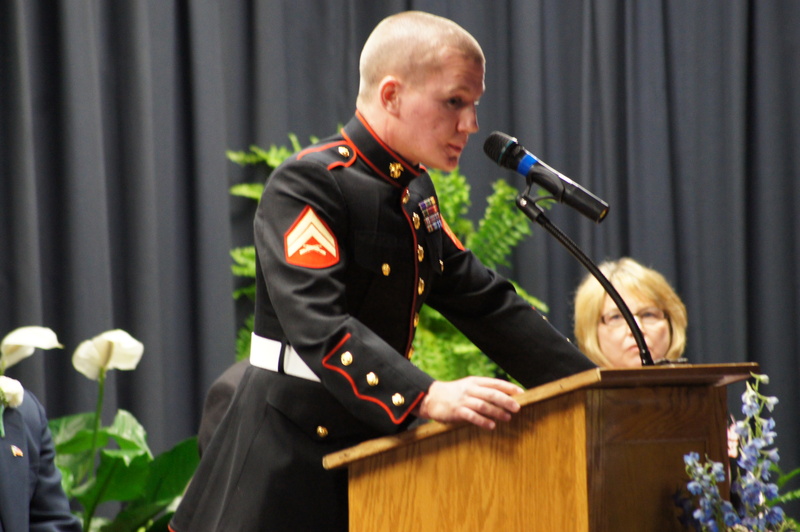 Kyle Carpenter always seems to wear a smile and a personable, approachable nature. Outwardly, it is clear to see that this young man has faced something horrific and many already know his story. Carpenter was stationed in Afghanistan in November of 2010 when a grenade landed on top of a building where he and a buddy were taking part in a fire fight. In an effort to protect his best friend and the rest of his unit, Kyle threw himself on the grenade and sustained some pretty serious injuries that included losing an eye, many of his teeth, and extensive damage to his right arm. After all that Kyle has been through over the last few years, I was anxious to hear what words of wisdom he might impart on the Senior class. 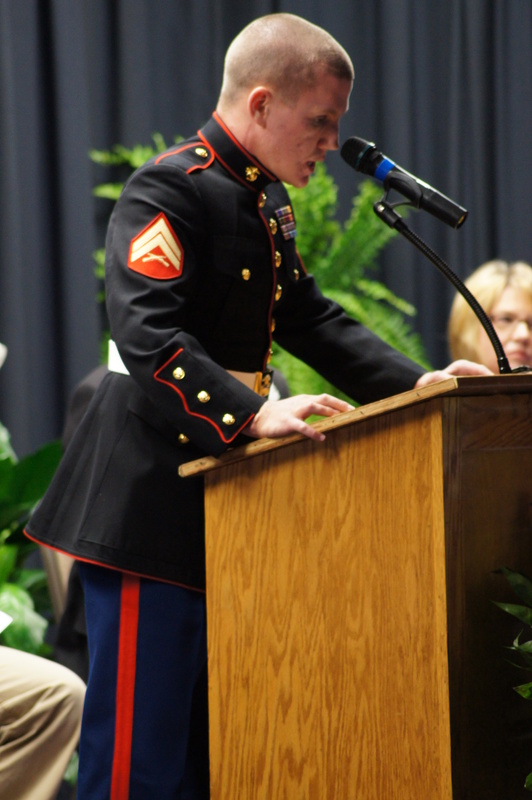 As the time came for Kyle’s speech, I listened closely. Part of Kyle’s message seemed so simple, yet so profound: be grateful. Be grateful that you can attend school and learn. Be grateful for clean drinking water. Be grateful for having the use of four good limbs. We sat quietly in our independent school setting where God is openly worshiped and praised, and listened to someone who has fought against the Taliban, has been severely wounded, and has not just survived, thrived and has used his injuries to better not only himself, but the world around him. Although he would certainly be entitled to be angry and/or depressed, Kyle, quite literally, “soldiers on.” Part of his message is to just be grateful for the little things in life we overlook every single day. How can something so simple be so difficult? I know that I struggle with it, and some days are easier than others. In the days following the recent tragedies that have come with Hurricane Sandy, the shootings in Connecticut, the Boston Marathon bombings, and the most recent Oklahoma tornadoes, it is easy to be thankful and grateful for my life, my children, my job, my home, my extended family, my wonderful friends, and my faith. Thank you, Kyle Carpenter, for reminding us to be grateful not just when tragedy surrounds us, but every single day and for every single thing.